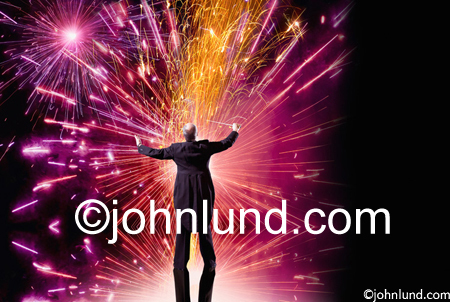 This image of a conductor orchestrating a vivid fireworks display was just found via Google on my site and then licensed through Blend Images. Art Directors and buyers do find images on Google! What particularly caught my eye in the new survey by Photoshelter “What Buyers Want From Photographers” were two statistics. First, 61% of buyers search Google for images, and secondly, 87% go to stock agencies for images (though it is a little unclear on whether the survey was indicating that 87% go to stock agencies for images…or 87% go to agencies other than Getty and Corbis…(but either way you can’t beat the agencies in terms of getting art directors to see your stock images). Think about it. If your images are not on your site, and your site isn’t optimized for the search engines, you are missing out on the chance of getting your work in front of 61% of image-licensing art buyers (be they designers, art directors, art buyers, editors or whatever). That is huge! On the other hand, if you are not with stock agencies your missing out on the 87% of image buyers (or more) who turn to agencies. I would propose that you are well served in having your images online on your optimized site whether those images are with agencies or whether you license them yourself. It just makes sense. If you are with agencies you can link your images directly to where people can license them through the agency. That way the process is automated…no negotiating, answering e-mails or phone calls or anything else. Just get a fatter royalty check each month (or quarter). I don’t take the trouble to track down how many of the twenty to thirty people each day that go from my site to the agencies actually license my imagery…I imagine it is a relatively low percentage. And yet, with Blend Images in the last week I happen to know that two art buyers found the images on my site, and then were directed to Blend where the licensing transactions were completed. In both cases I had forgotten to provide the link from my site to the Blend Images site and had to manually provide that link to the buyers. In those two cases the increase in my own income amounted to just over $800.00. Yesterday I also completed a transaction in which I licensed two more images, that are not with any agencies yet, for a total of $600.00. My stock photography income would be noticeably lower at this point without my efforts at getting my pictures online and putting the time and effort into SEO. The downside thus far has been the tremendous amount of time and effort I have put into the site...time and effort I believe will be well rewarded over the coming years. Further, by doing this work now, if at some point it makes sense to be licensing more, or even all of my own work, I will already have the hardest thing to achieve in place…the traffic! If that sort of back-up plan is important to you, then the time to start is now. Building traffic for your photo site takes time…and a lot of it. Plan on giving it three to five years to achieve decent results. Of course, what "decent" means can vary. It has taken me two and a half years to go from one person a week to well over a thousand a day...and my goal is ten thousand a day (got a ways to go). One more thing. As any successful business can tell you, success comes from servicing your clients well. When you put your images online and provide proper SEO, you are making the lives of art buyers easier. You are helping them find the images that solve their visual problems. Simply put, getting your photography on the Internet, and making it easy to find, is good business. Airport Control Tower Inspired by Sleeping Traffic Controllers! An airport control tower, and a dramatic cloud photograph were combined to create a concept stock photo about management, control and vision. Two weeks ago, before all the controversy and news around air traffic controllers sleeping on the job and watch Samuel Jackson DVDs, I found myself on a jet landing at the Maui airport. On my lap was my Canon 1DS MKIII with a L-Series 100-400 zoom lens mounted. As we taxied towards the terminal I scanned the scene through my window for anything interesting to photograph. The only thing that caught my eye was the airport control tower. I squeezed off a half dozen frames with the lens fully zoomed in to 400 millimeters. I have to say I love that lens! Mine is exceedingly sharp. Even shooting from a moving aircraft, and through a well-used porthole window, I managed to get one pretty sharp shot of the tower. The trip to Hawaii, I might add, was intended not for any specific shoot, but rather to “harvest” images for future projects…and to do so in a pleasant environment. An aside here, pictures of Hawaii still sell even though one has to question how there could ever be a need for another tropical beach scene! I have had great success at making travel into profit centers through my stock photography. So here we are two weeks later and air traffic controllers are dominating the news. Hmmm, says, I, an opportunity for a stock photo! This is one of those insanely easy to create images. I simply used the Photoshop Pen Tool to create a clipping path around the tower, turned it into a selection with a one-pixel feather, and then hit my good old “Command-J” to create a new layer of just the control tower. I went back to my Hawaii photographs and found a dramatic cloud I had photographed at Ho'okipa Beach Park (near Mama’s Fish House). I copied it and pasted it underneath the control tower layer. I duplicated the tower layer again, used a layer mask to “paint out” the actual room at the top, then dragged the remaining structure down to create the effect of a much taller structure. A little “dodging” around some of the antennae, and of course spotting, and Voila, a new stock photo! BTW, I bought the 1DS MKIII when they first came out…and have never cleaned the sensor! Hey, it is dirty, and I do need to clean it…but how clean it has stayed, with repeated lens changes, is pretty amazing! I was even changing the lenses between the 100-400 and a 16-35 zoom on the beach with the wind buffeting me like crazy. 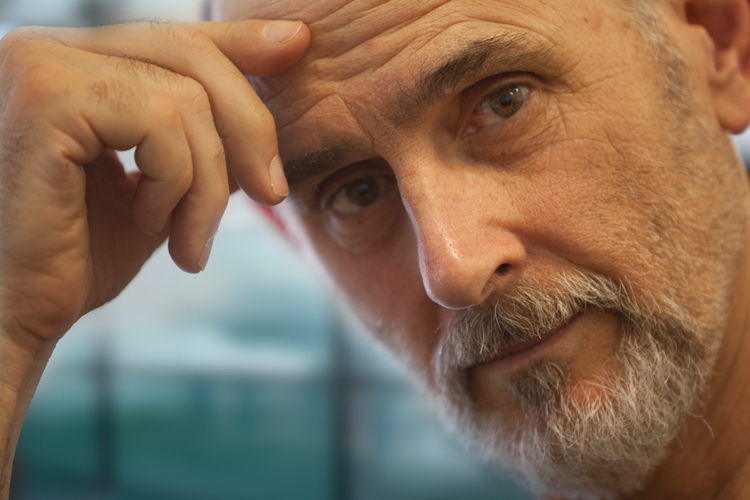 But I digress…back to stock photography! This airport control tower image is about not just the turmoil around the air traffic controller problems, but is a concept stock photo about management, vision and change. It can be used for editorials about everything from turmoil in the air traffic controller industry, to airport expansion plans, to more general advertising uses for products and services that can help companies manage operations and communications more effectively. This tower image can be about management, control, communications, change, and who knows how many other uses. It took less than an hour from start to finish for the post-production and other than my general travel expenses cost me nothing to photograph. How cool is that?